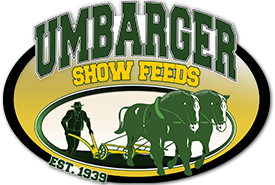 Eric King joined Umbarger Show Feeds in 2008. Eric graduated from The Ohio State University in 2006 with a degree in Animal Sciences. Before joining the Umbarger team, Eric managed a cow/calf and show cattle operation in northwest Ohio. Eric is our salesman for Ohio, Michigan, Pennsylvania, and North Carolina. Eric works with dealers and customers on a daily basis and holding many show and feed clinics throughout the year. Eric grew up on a registered Angus and grain farm located in Tiffin, Ohio. Eric was involved in 4-H for 10 years and FFA during high school. During his 4-H and FFA career, Eric showed cattle, sheep, and swine at the local, state, and national level. Eric brings determination and knowledge of the livestock industry to make him a valuable asset to our company. Involvement in the show industry helps Eric relate to different needs of the customers. Eric and his wife, Megan, reside in Tiffin, Ohio and have two children Wyatt and Chloe. In his spare time he helps out on the family farms and volunteers for many different organizations in the livestock industry. You will also see Eric and his family at many livestock shows all over the country.